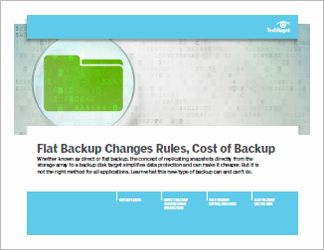 Flat backup, also known as direct backup, is a backup approach based on storage snapshots, and it's gaining popularity. 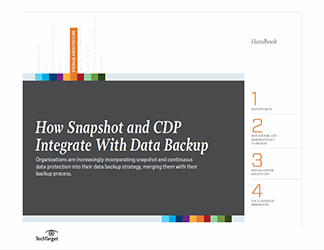 It allows users to copy data directly from primary storage to secondary storage without the use of a backup server and software. Its major benefits are simplicity and low cost. However, the approach requires specific technologies and can't protect every resource in an organization. Direct backup is not entirely new, either. Some vendors have supported it for years. And a number of additional vendors have gotten behind this technology recently. It has become a more viable option in recent years because of improvements in snapshots. These products rely on redirect-on-write snapshots, which have a lower impact on performance and allow snapshots to be taken more frequently. In all cases, the systems are proprietary, and in most cases are only possible using specific systems. 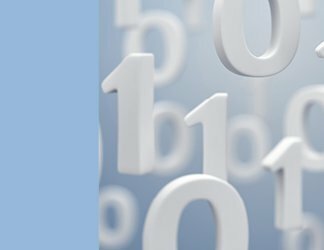 Because of these limitations, flat backup will not be the right approach for many organizations. But in some cases, it can be very useful. Our Drill Down on flat backup will look at the technology in detail, explain how it works and the hardware that supports it, and discuss possible uses. 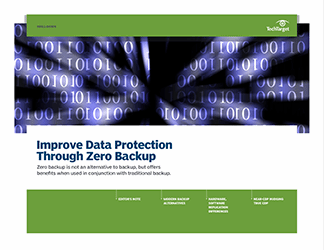 It will also provide examples of when direct backup is not appropriate to help you decide whether the technology will be effective in your environment.